Unless you are living under a ROCK, you have probably heard of Amber Dusick’s blog Parenting: Illustrated with Crappy Pictures. I fell in love with Amber at first read, subscribed via email immediately and find myself giddy when I’m informed of a new post Amber has written. I selfishly dream of her illustrating one of my old blog posts like Grocery Shopping With Children Should Be An Olympic Event or Standing In The Shower… Thinking someday. When I heard Amber was writing a book based on her awesome blog, I couldn’t have been more excited! I actually read the book in nearly one sitting… ok, so a few bathroom sittings followed by moments I stole in my recliner while the kids were watching random annoying children’s shows on tv. 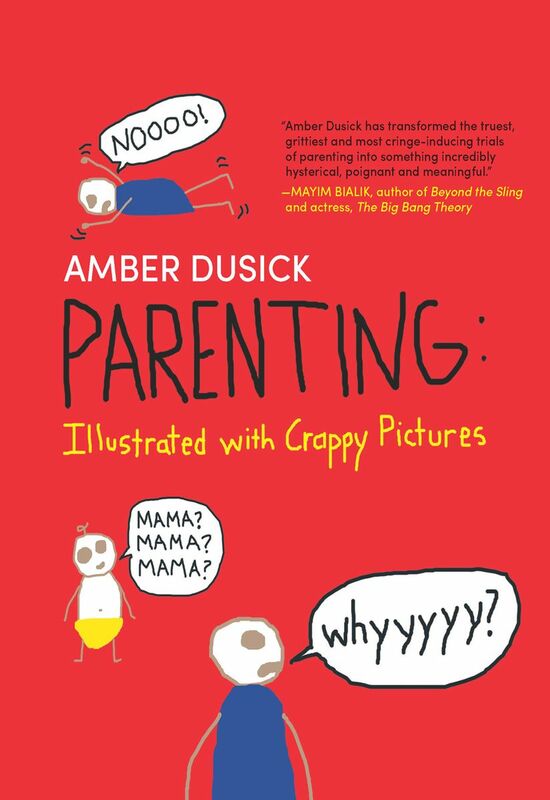 Reading Parenting: Illustrated with Crappy Pictures had me spewing beer out of my nose with laughter, nodding my head and even raising my hand at appropriate times. I felt as if Amber had crawled into my head to illustrate my own life on several occasions. Especially while reading The Crappy Laws of Parenting… which = genius. Parenting is not easy or even remotely fun 100% of the time, but like Amber, I choose to find ways to laugh at the craptastic moments, even if that requires putting a little alcohol on these moments to uncover the humor. I was lucky enough to attend the Crafting A Book Proposal Session at Type-A Parent Conference last year. Yes, I do dream about writing my own book someday. And a big take-away our awesome speakers passed along to our small group of bloggers was to support bloggers’ books by… get this: BUYING THEIR BOOKS! Yes, I’m giving a copy of the book away, however, Parenting: Illustrated with Crappy Pictures will make a FANTASTIC & affordable Mother’s Day gift for Mothers of all ages. In the meantime, enter to win a copy here and order a copy for a sister, aunt, friend, etc. Laughter is not a crappy gift at all. Still need convincing? Check out the hilarious trailer for the book on YouTube. Disclosure: All opinions expressed on MommaNeedsABeer.com are your 2-year old’s favorite word: MINE! Giveaway is open to US residents 18 & over only. Facebook, Twitter and Blogger are in no way associated with this giveaway and are not responsible for prize fulfillment. Winner will be notified by email and will have 48 hours to claim their prize before a new winner is picked. Giveaway ends April 13, 2013 at midnight EST! Some of the above links may be affiliate. This entry was posted in Uncategorized and tagged books, Crappy Pictures, Giveaway. Bookmark the permalink. Post a comment or leave a trackback: Trackback URL. I LOVE Parenting with Crappy Pics!!!! She cracks me up. Would love to have her book! I love to look for something that relates to my day, so I can laugh about it! I’m sure the book is awesome! I know exactly what you’re saying… so helpful to know that you’re not alone. And always helps to laugh about it. I do! I love the one where she illustrates the horrors of taking children to public restrooms. The Target one is a favorite of mine as well!! LOVE this blog! My favorite is the “Fetti! Fetti!”. I die everytime I see it! YES! The Fetti is in the book!! Love it! Definitely! SO spot on… Good luck & thanks for entering!! I love the blog, would love to have the book, too! Yes, it’s a fun read. Good luck & thanks for entering, Katie! Love the blog – want the crappy book!! My favorite is the Fisher Price Laugh and Learn dog post. Hilarious! I totally forgot about that post, Glenna… awesome! Thanks for entering! I couldn’t agree more, Christina. Thanks for stopping by to enter the giveaway! Love this blog and so damn excited that there’s a book!! For all those bang-your-head-against-the-wall parenting moments!! YES! Very exciting, isn’t it? You’ll love the hell out of this book. Good luck… and CHEERS, Alexia! I love the trailer for the book. Isn’t the trailer awesome?! Had to include it. Thanks for stopping by to enter, Yvonne! So hard to pick a favorite… ‘what it’s like (not) to sleep at night’ is at the top! Oh yes, Stephanie, that one is CLASSIC! Thanks for stopping by to enter… good luck! My favorite is the one about how all parks have crappy designs. Loved seeing her view and thinking – been there! Another relatable post for sure. Thanks for stopping by to enter, Charity. Good luck! Holy cow, what an apostrophe can do to a computer…..sheesh. Today’s post about Crappy Baby being #2 and going #2 was pretty good. Considering that the topic of poop has been a hot once since I gave birth over 8 years ago — yes, any post about poop is a winner in my book, too! Cheers to you, Boise! Good luck! What it’s like to (not) sleep at night. Such a classic post. Thanks for stopping by! You’re cracking me up, Denise! Thanks for stopping by… Cheers and good luck! No I love her blog to much to pick a favorite. I couldn’t agree more, Susie. It’s like picking a favorite child… or beer. 😉 Thanks for stopping by to enter! The one where she talks about how awesome it is to get new fluffy mail. It was the first post I read of hers and was hooked ever since. Such a great post… Thanks for stopping by to enter, Andrea! Cheers! My favourite post is the one with the mutated virus… so my house!! Oh yes, Jenn… definitely. Thanks for stopping by to enter! YES! Love that post, Sadie. Thanks for entering the giveaway! Good luck! It is crazy how much things have changed since we were kids, isn’t it? Thanks for stopping by to enter! This is the first I’m hearing about this blog–and I can’t wait to check it out. So no favorite yet, but I’m sure there will be one soon! Enjoy catching up, Gina! Amber’s posts are so easy to absorb. CHEERS! I agree… Amber is the cream of the crop! Thanks for stopping by & entering! Good luck! I would have to say it’s the sleep one where crappy baby turns into a starfish! YES! The hubs has turned into a starfish on me in the middle of the night after I’ve gone to the bathroom too… kinda crazy. Thanks for stopping by, Jeanna! CHEERS! I just found Amber’s blog recently and have been enjoying many laughs while my baby naps during the day. I would love to have her book! Fantastic! If you love her blog, you’ll love her book. CHEERS! I liked the While Mama was in the Bathroom series. So relatable. I LOVE that series too! Definitely. Thanks for entering, Jana! CHEERS! I’ve followed her blog for a couple of years now, but as I went back over to remember my favorite, I stumbled across one that I hadn’t seen before which is now my most favorite – the house tour (8/17/11). If that doesn’t just scream “MY LIFE!!”. HA! Classic. Thanks for stopping by, Jennifer!